He won't stop charging if he won't sit on command. An open door can be really exciting for a dog. It could mean her owner is home, an invader is entering or even just that she can go outside. If your dog charges every time the door opens, the best solution is training her to just sit down. Keep training simple when you start out. You can't just teach a dog "sit still and be cool when the door opens." You have to break it down, first teaching the command and then introducing distractions like the door. For now, you don't even have to be in the same room as the door. Just get your dog in a nice, calm place so she can focus on you. Train your dog the basic commands of "sit" and "stay." She will never, ever stop charging the door unless she knows these commands and obeys every time. Train her to not leave her sitting position until you give a release phrase, like "all done." Introduce distractions -- in this case, the door. If you have a partner, sit with the dog in the same room as the front door and give her the command to sit. Then have your partner slowly open the door from outside. When your dog starts mobilizing, give her the sit command again -- if she doesn't obey, have your partner close the door. Call her back and have her sit back down, then repeat. Keep repeating until she stays seated until the door opens, your partner comes in and the door closes again, then lavish her with a ridiculous amount of praise and have your partner give her a treat. Repeat. Train your dog to go to a specific spot in the room. This works as an alternative to the "sit" technique. By giving your dog the command to go to a place like her bed or kennel, you prevent her from bolting for the door when it opens. 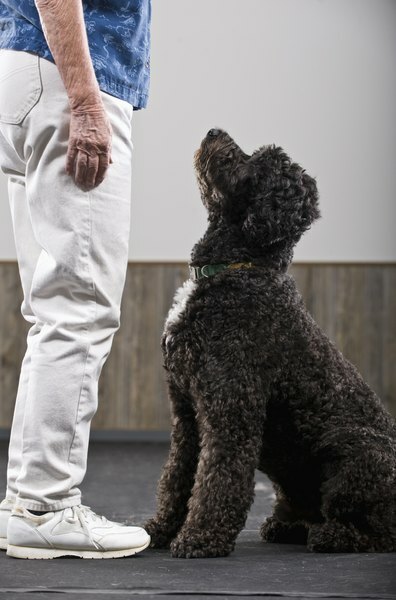 Whether teaching your dog like this or through the "sit" technique, the essence of the training is that you aren't just teaching your dog not to charge the door, but teaching her to do something else instead. That way, she learns from positive reinforcement rather than punishment. Be consistent with your training even after she appears to get the idea. While you can't always preemptively give a command to prevent charging the door, if you are consistent with teaching proper door behavior, you can give her the command after she starts charging and she'll switch gears. Experiment with your dog during training, as dogs respond to different stimuli during the learning process. For example, some dogs are more subservient and better learners if they wear a collar or even a leash while you work on commands. If you don't have a partner to open the door from the outside, secure your dog inside by hooking her up to a leash and attaching the other end to a piece of furniture. Then go outside and assume the role your partner would fill.